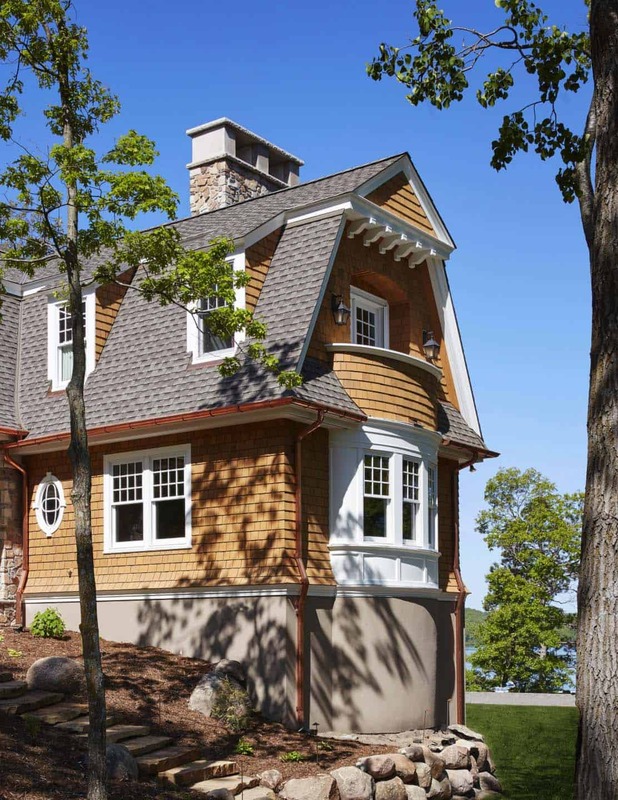 This gorgeous shingle style lake house was designed by Murphy & Co. Design and built by John Kraemer & Sons, located on Brainerd Lakes, northern Minnesota. Wrapping itself around the curving shoreline, this family vacation home is perched high atop a bluff and surrounded by towering aspens and pines. 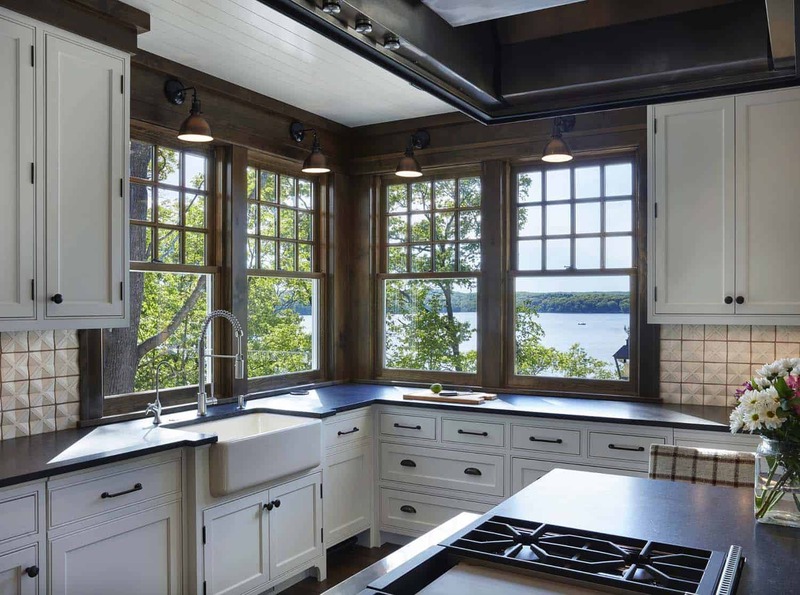 The kitchen extension is wrapped in glass, and features a roof deck above it which is accessed from the loft, showcasing magnificent elevated views of the picturesque lake. 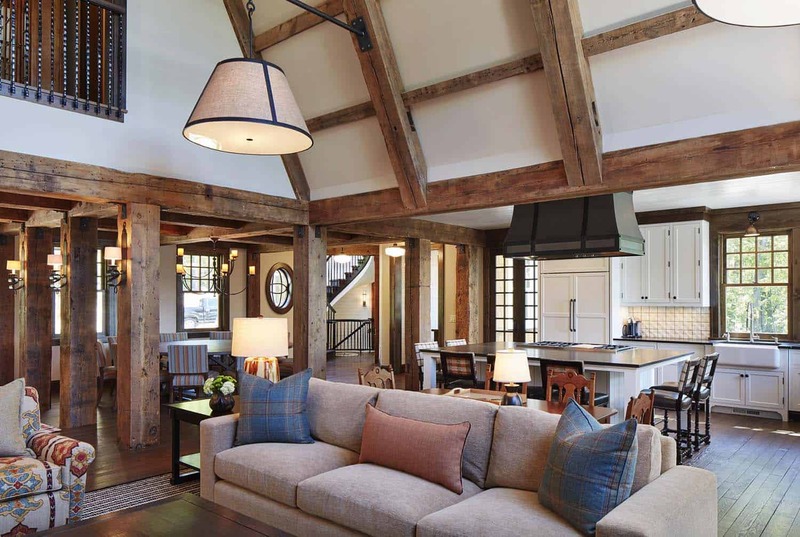 This sophisticated, modern, yet casual home features rough wood flooring, original finish timber ceiling beams and massive reclaimed interior support columns which reflect a strong connection to the vast neighboring northern forest. 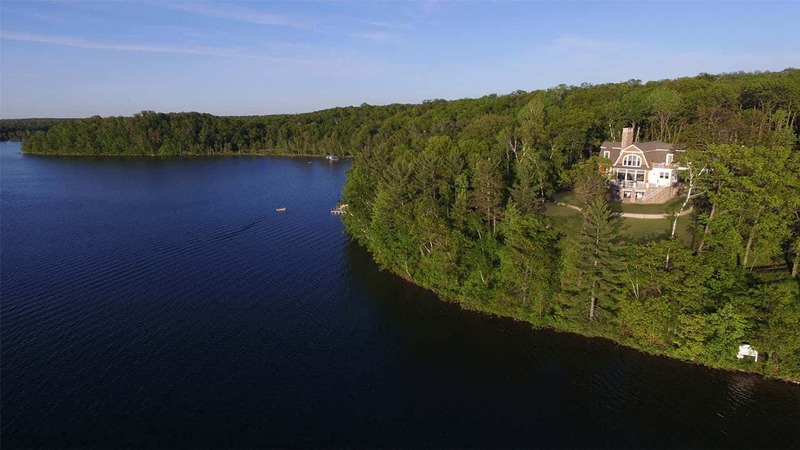 What We Love: This fabulous shingle style lake house offers laid-back lakeside living at its finest. 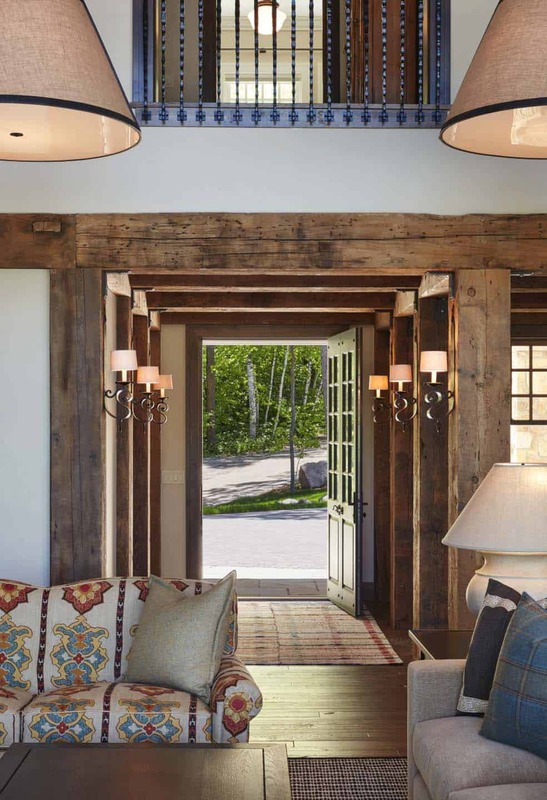 Absolutely stunning architectural features are evident from the moment of arrival and continues through the front door. 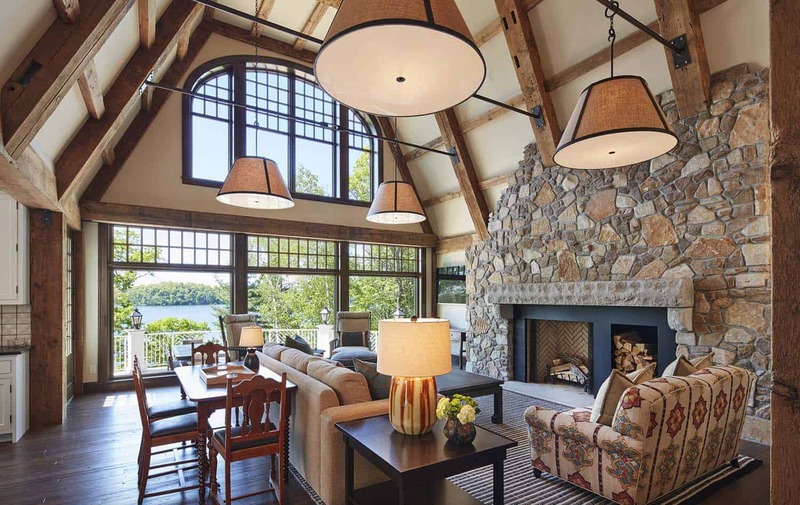 Breathtaking views are offered through expansive windows, which also helps to illuminate this beautiful home with natural light. 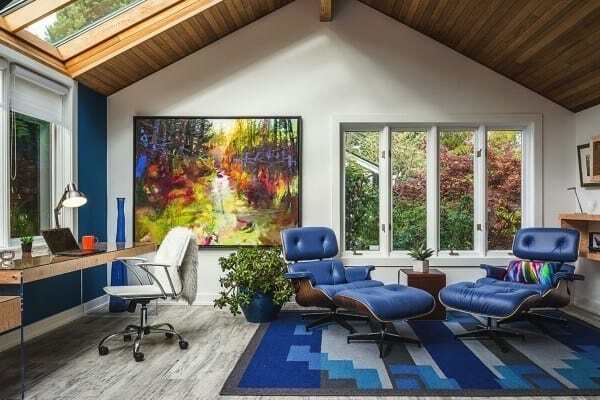 Overall, this home offers comfort, warmth and an inviting feel throughout… Readers, what do you think of the design style of this home? Any details caught your eye? Tell us in the Comments! 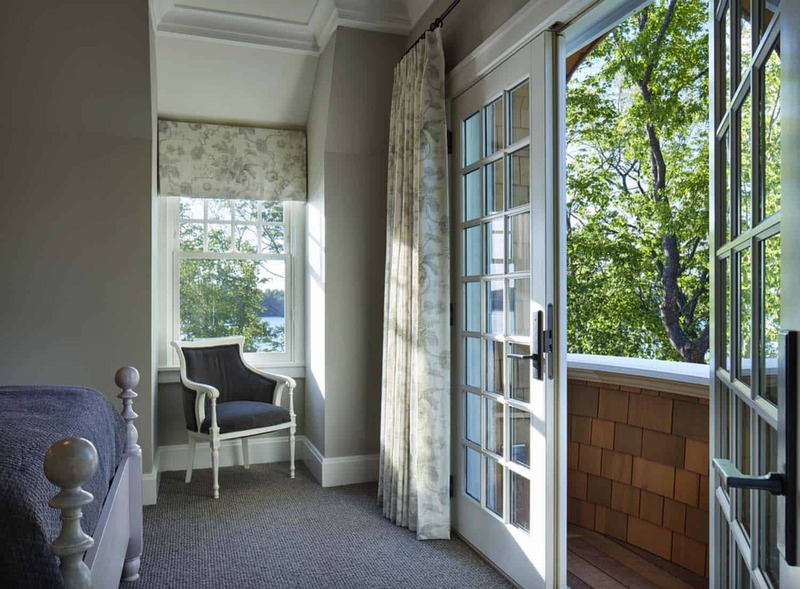 Note: Have a look at a couple of our favorite home tours that we have featured here on One Kindesign from the portfolio of the builder’s of this project, John Kraemer & Sons: Idyllic contemporary residence with privileged views of Lake Calhoun and Breathtaking shingle-style residence on Lake Minnetonka. 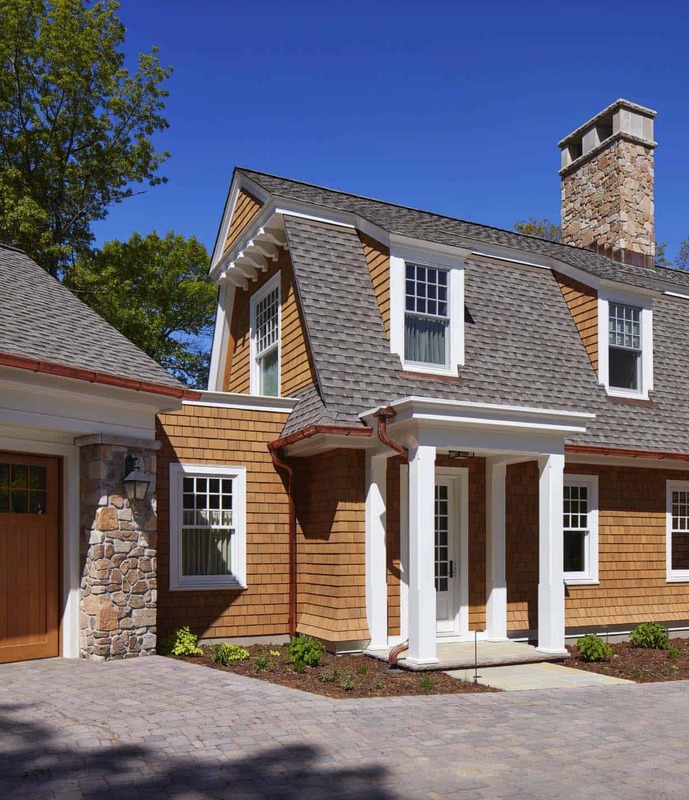 Above: An authentic shingle style home with its asymmetrical design that features a gambrel roof, a bell-roofed stair tower, and classical details. 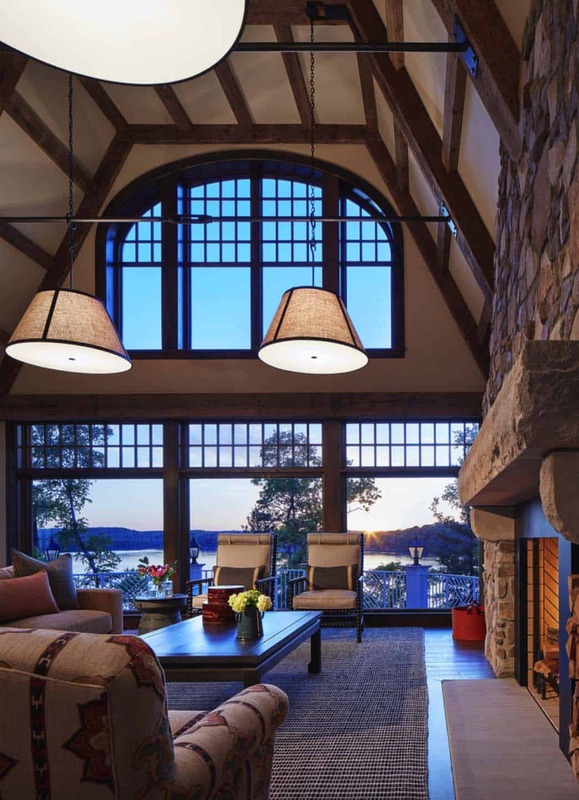 Above: A capture of the side gabled roof shades the rounded balcony and bow windows with views to the expansive forest and lakeshore beyond. 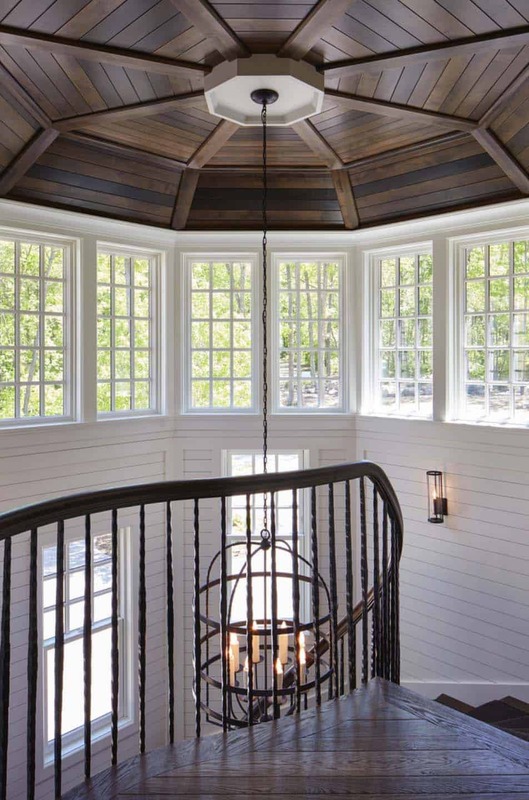 Above: Nautical reference is found here in the stair tower, with custom flanking oval window and flared shingle base. 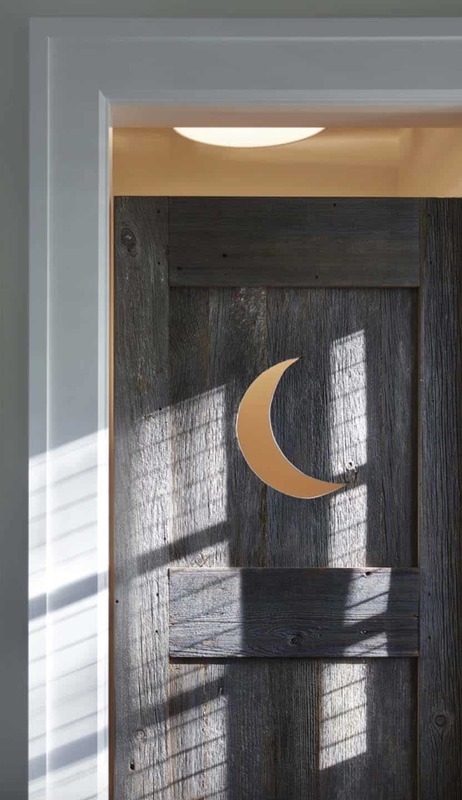 Above: The pairing of aged iron and weathered wood is a thread throughout the home, evidenced here in the iron column connection plates and the custom designed iron balcony. 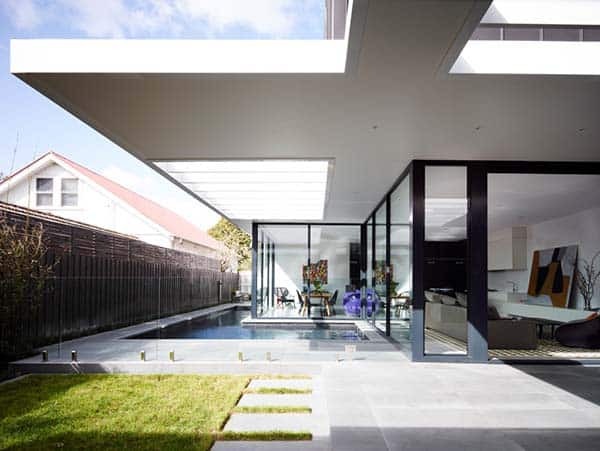 Above: The sun and the stars flow in to this open floor plan that is wrapped in a collection of windows. 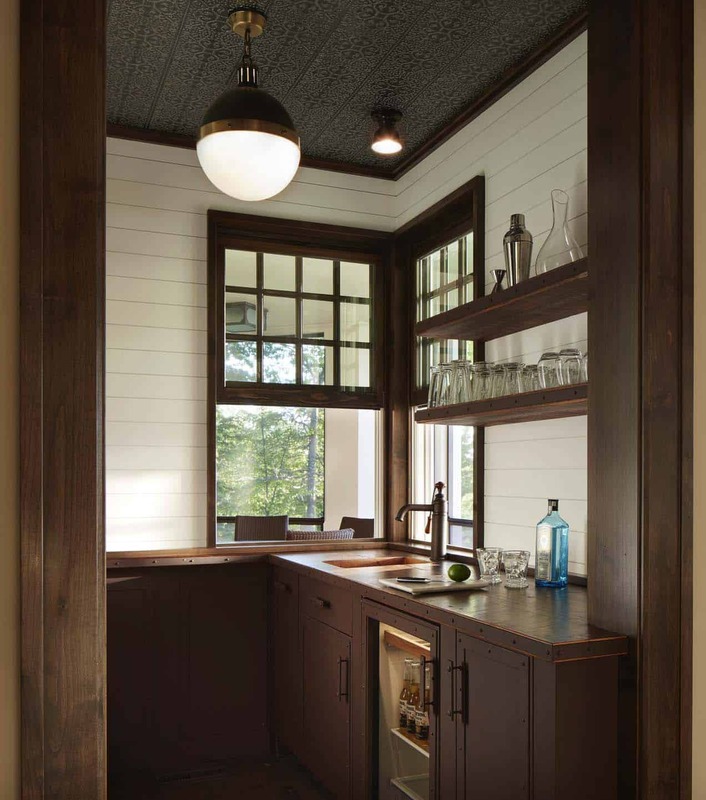 Above: A mixologist’s room finished with a tin ceiling, metal faced riveted cabinetry and windows that open to serve the adjacent screen porch. 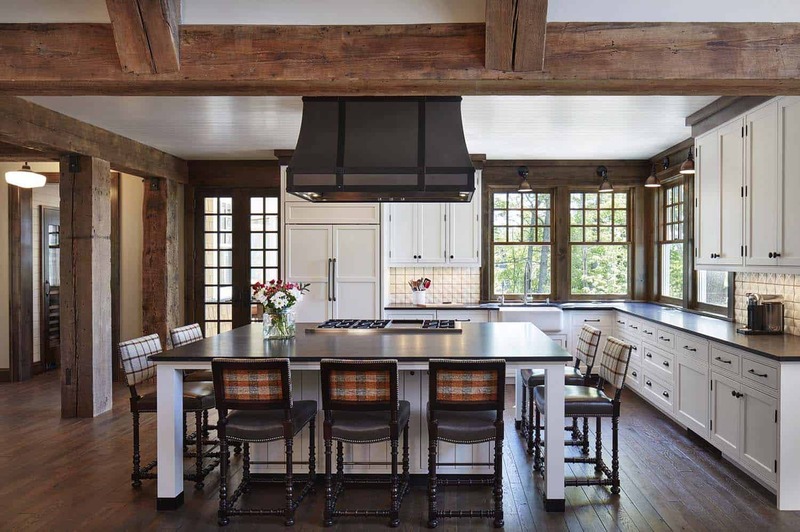 Above: The overall dimensions of the kitchen island are 6′ x 8′. The countertop stone is Raven granite in a honed finish. 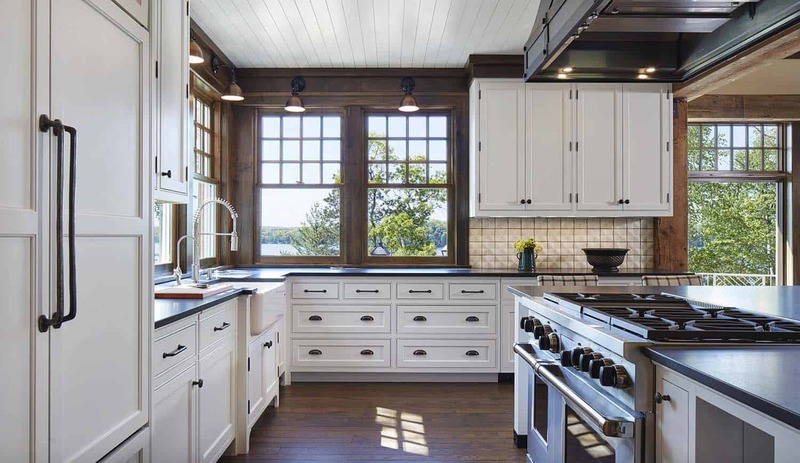 Above: The white painted wood plank board ceiling and custom designed iron hood provide nautical and casual touches to this chef’s kitchen. The cabinetry color is Benjamin Moore “Cloud White” #967 and the walls are Benjamin Moore “Natural Linen” #966. Above: The kitchen backsplash features a custom glazed, dimensional terra-cotta tile is from Tabarka Studio, pattern Noblesse 4 in off-white. Above: A close view of the hanging lights integrated around the iron ceiling tie rods. Above: The fireplace is housed under a wall of rough and tumbled rubble stone and a tumbled limestone lintel, set around a deep black iron surround. The puzzle table behind the sofa is an antique piece, 30″ x 54″. Above: An organic edge to the rubble stone fireplace wall. 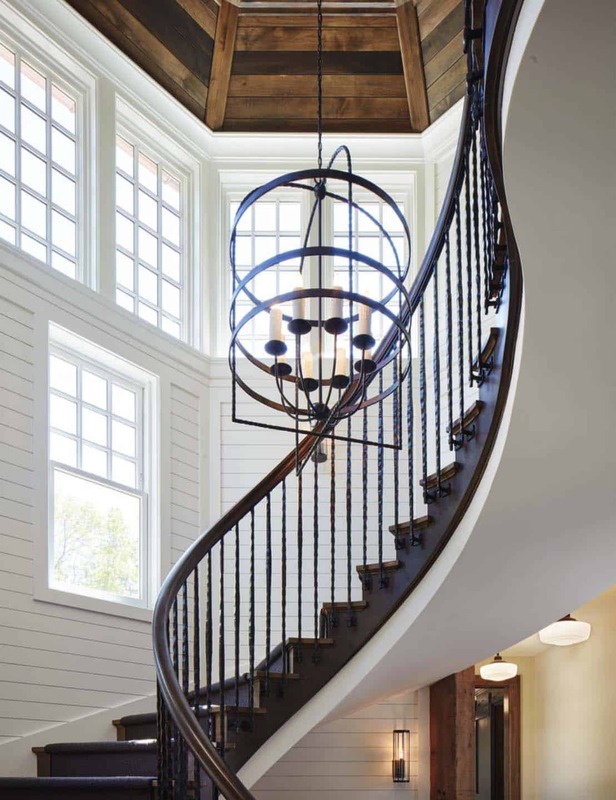 Above: A graceful serpentine curved staircase with side-mounted balusters is capped by an octagonal vaulted ceiling. 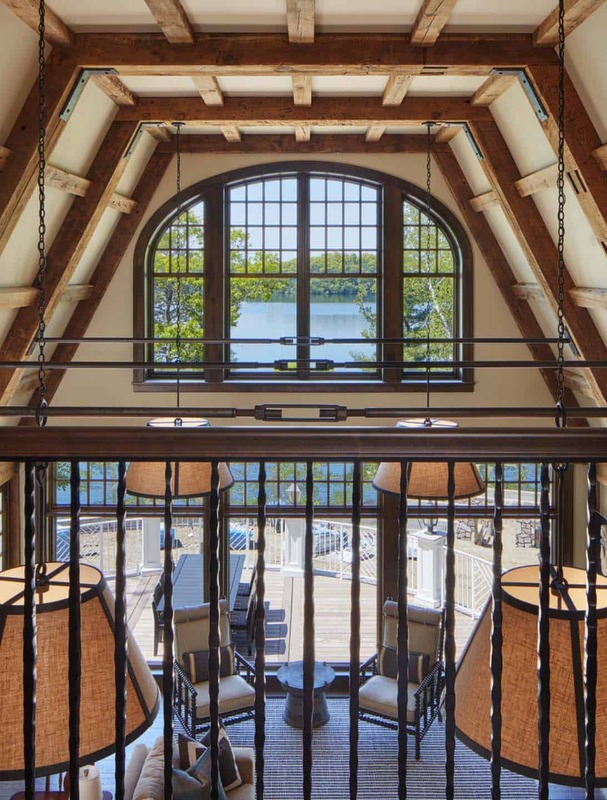 Above: The view of the timber boned ceiling and the stunning lake beyond from the second floor walkway balcony. 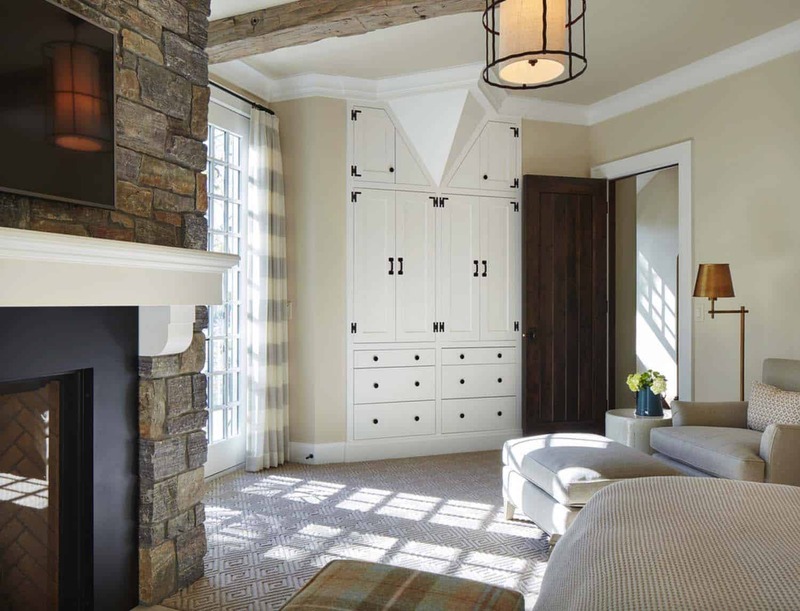 Above: A wall of custom designed cabinetry in the owners’ suite, with cabinet doors concealing the entry to the private bath. 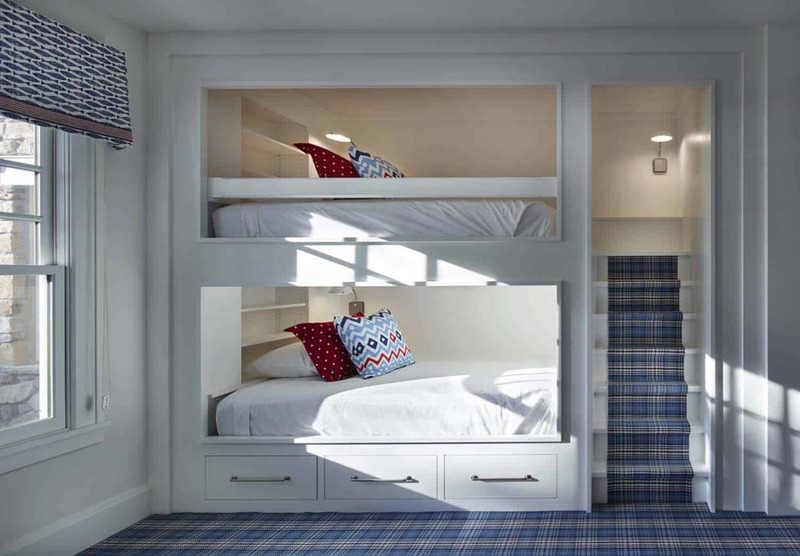 The storage wall is deep enough to allow for 2′ interior depth hanging space. 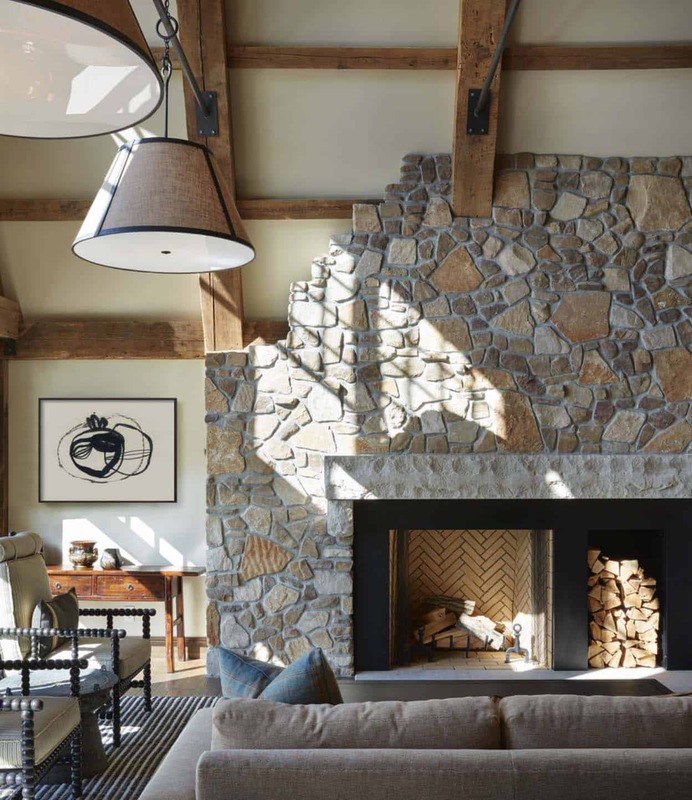 The fireplace stone is a custom natural stone blend for this project. 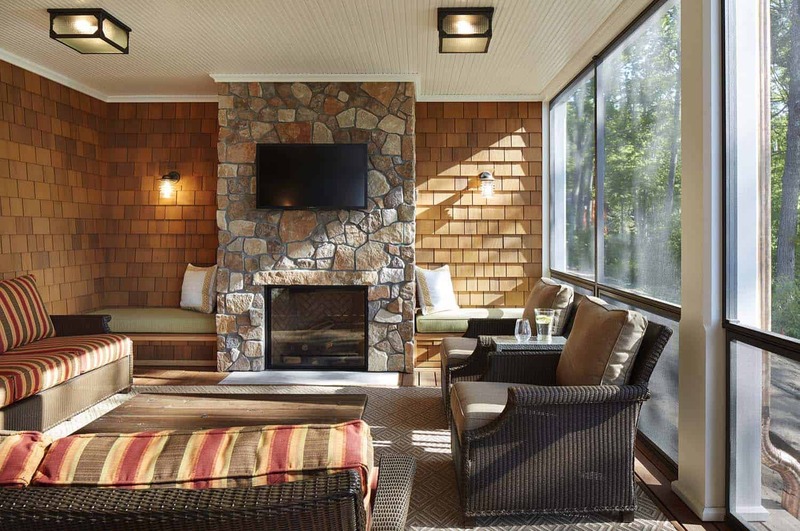 Above: An untreated timber ceiling beam is centered on the walkout to the balcony from the owners’ suite. 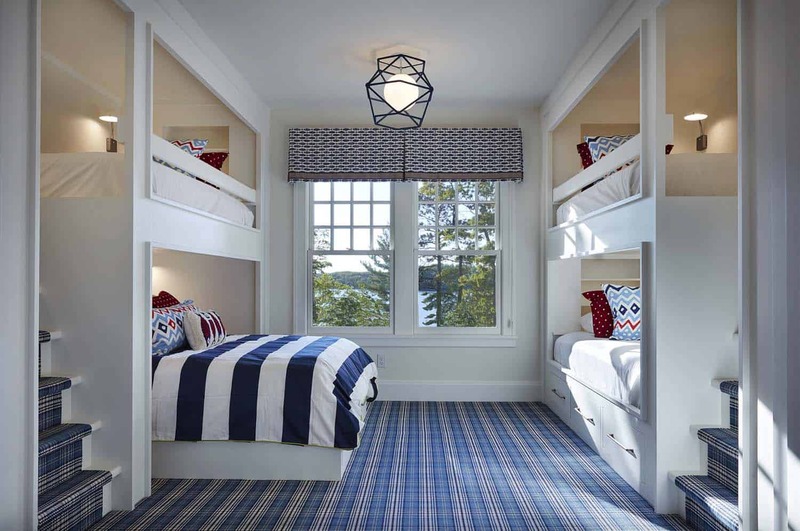 Above: In the playful kid’s bunk room, the walls are painted in Benjamin Moore “Cloud White” #967, matte finish. 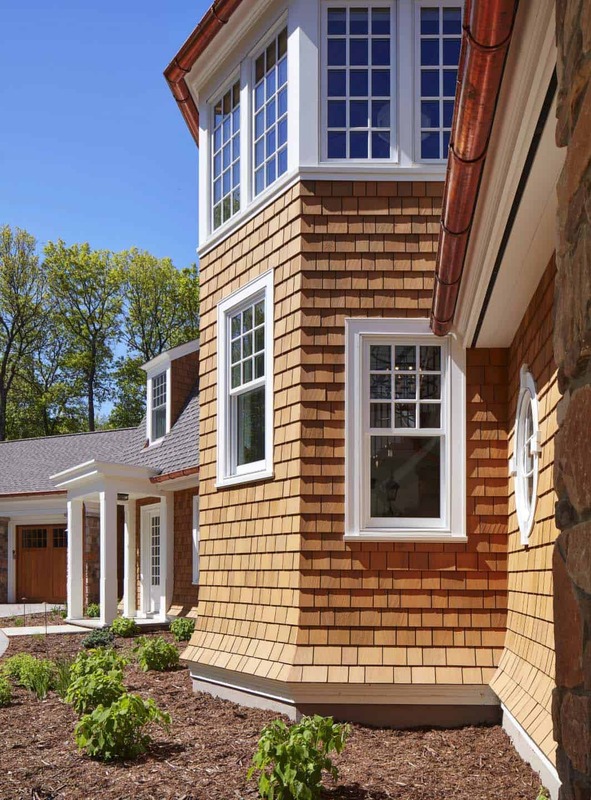 The millwork is painted in the same color, eggshell finish. 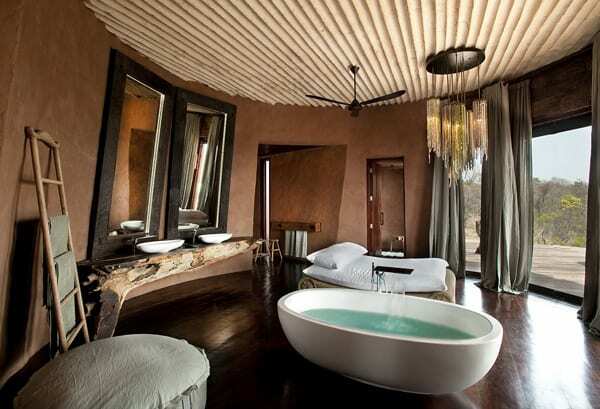 The ceiling is also Cloud White, flat finish. The light fixture is Bone Simple Design’s hexagonal cage rope fixture (medium size) in a custom color. 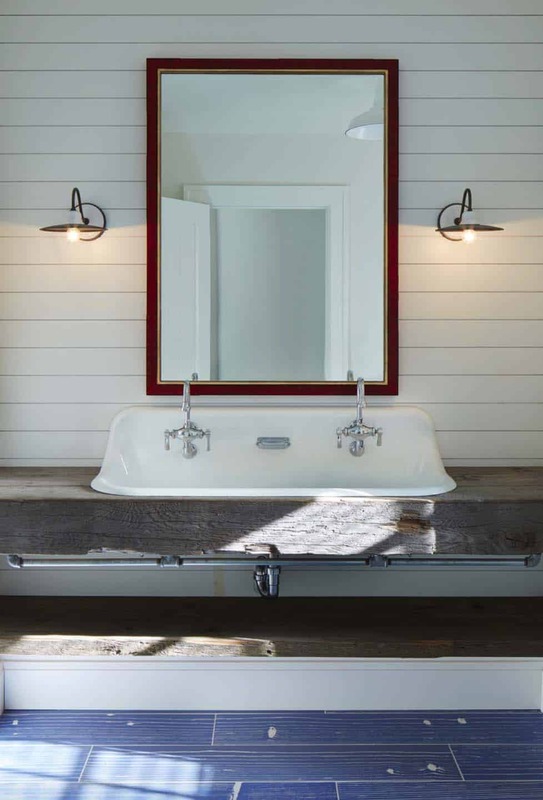 Above: Shiplap sided walls are the backdrop for vintage utility sink set in to a weathered alder wood vanity. The sconces are from Currey & Company. 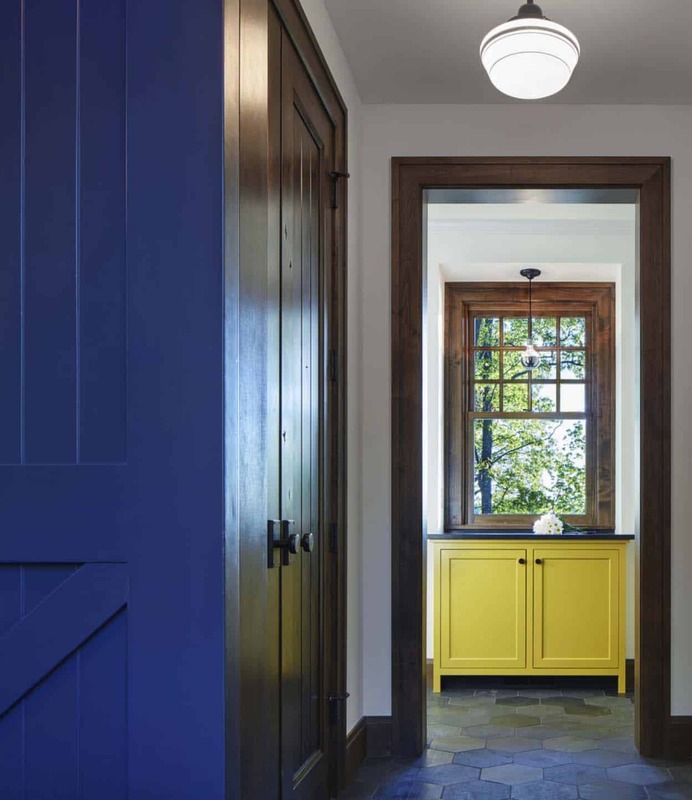 Above: The cabinet color is Hirshfield’s 0808 Yellow Lupine in a satin finish.